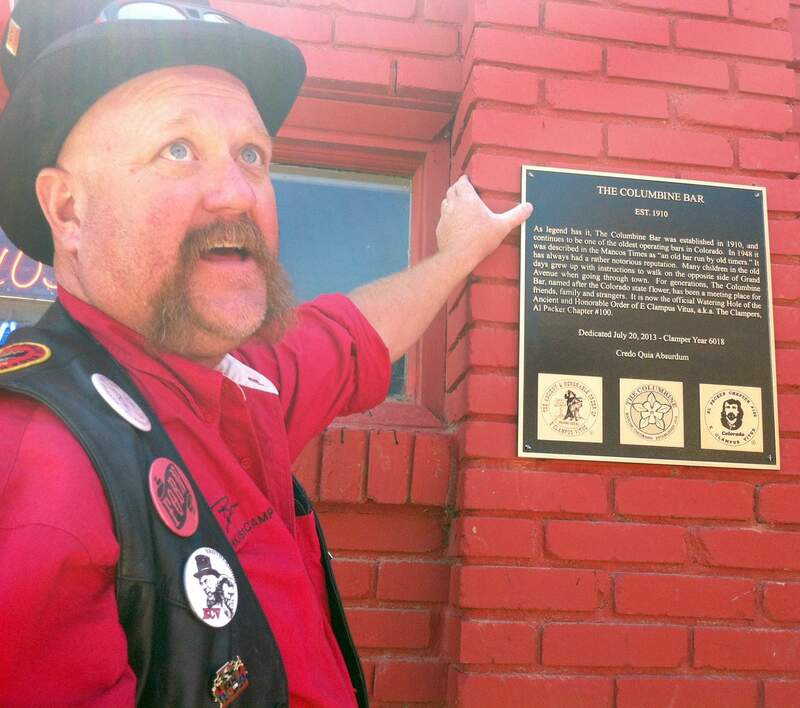 A Clamper, who gave his name as R.J. and said he was the Humbug of Colorado, reads a historical plaque unveiled in 2013 at the Columbine Bar in Mancos. Ownership at The Columbine in Mancos, one of Colorado’s oldest saloons, changed hands on New Year’s Day. Formerly held by a six-person partnership, The Columbine is now owned by Tammy Davison, Michael Trejo and Sherri Duran. Effective Jan. 1, the ownership transfer was officially approved by the Mancos town board last week. Davison, one of the six previous owners, said she joined with Trejo and Duran to purchase a larger percentage of the business. She and Trejo have been residents of Mancos since 2007, and Duran has lived in Mancos since 1980. All three are natives of Arizona. With more than 20 years of professional experience managing bars and taverns, Davison said that meeting interesting people was the best industry perk. “I love talking football with customers,” said the Green Bay Packers fan. Although a painted sign hanging from wooden rafters dates the saloon to 1903, a plaque on the brick facade indicates the Columbine was established in 1910. Despite the seven-year gap in the saloon’s founding date, there are no qualms about the notoriety of The Columbine, including the murder of a former owner by his estranged wife. At one time, children in Mancos were also warned to walk on the other side of Grand Avenue when passing the saloon. The earliest known saloon owner was Walt Coppinger, who operated The Columbine in the 1930s.